Part of Honeywell's family of self-contained wireless controls, Honeywell's Lynx Touch 5210 features a bright, 4.3" full-color touchscreen with graphic icons and intuitive prompts for easy operation. It features live video on demand, garage door notification and control, tornado alerts for U.S. and Canadian residents, Z-Wave automation capabilities and advanced alarm communications. The WiFi module L5100-WIFI offers the lowest cost alarm communications remote services solution saving installation time and reducing monthly operating costs. Whether used as back-up or primary, the advanced cellular radio finds the best Verizon LTE signal in the area improving longevity and maximizing installation opportunities. These options give DIYer's the flexibility they need to service, whether they rely on mobile phones, VoIP or POTS lines. With it's uncompromising technology, reliability and self-contained architecture, Honeywell's Lynx Touch L5210 is an easy-to-install dual-path security system. 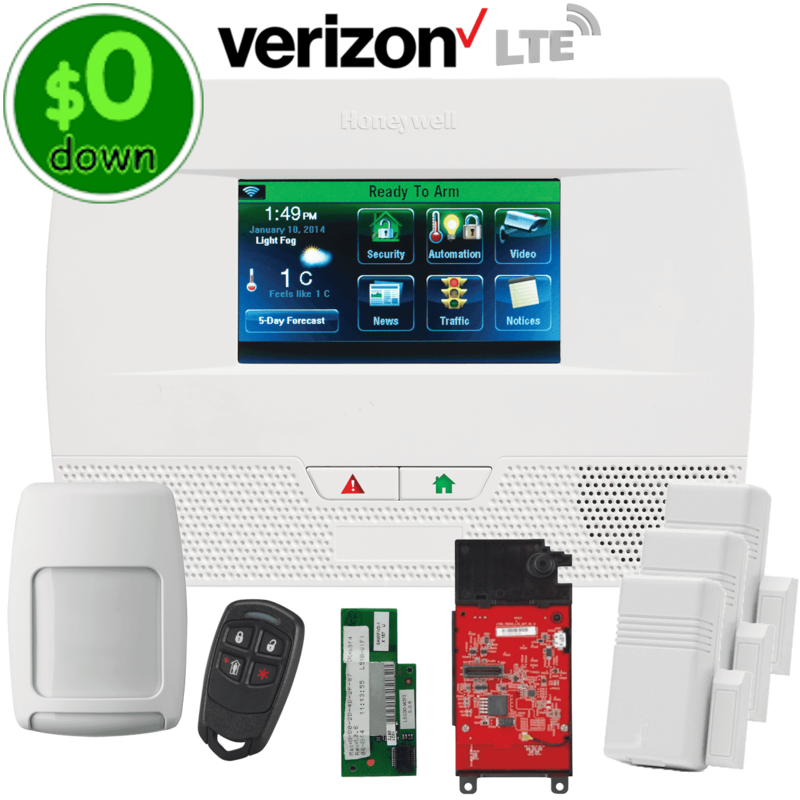 This Honeywell Lynx Touch L5210 wireless security system kit includes; (1) wireless control panel L5210, (3) wireless door/window contacts 5816WMWH, (1) wireless pet-immune motion detector 5800PIR-RES, (1) remote 4-button keyfob 5834-4, (1) WiFi alarm communicator L5100-WIFI and (1) cellular Verizon LTE alarm communicator LTE-57V. With dual-path communications, the Honeywell wifi module L5100-WIFI serves as the primary communication path, and if down, the wireless cellular module LTE-57V provides the backup Verizon LTE communication path for your Honeywell Lynx Touch L5210 control panel to send data to the AlarmClub central monitoring station.